The Tuesday bird walk went to the Englishman River Estuary on the Shelly Road side in Parksville. The morning was sunny with calm winds. A large flock of Trumpeter Swans greeted us as they flew over head at the start of the walk. We spotted a singing Hutton’s Vireo sitting fairly low in a tree along the trail. A large number of Chestnut-backed Chickadees were seen in the same area. 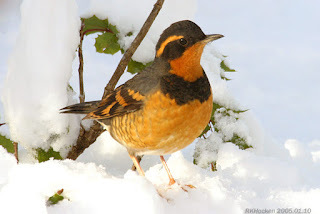 Six Varied Thrush were spotted along the ground not far from the trail. A Eurasian Wigeon was seen in with a flock of American Wigeon and Green-winged Teal resting on the estuary. A pair of Barrow’s Goldeneye and a pair of Common Goldeneye swam along the estuary. Three Brant flew down the Strait of Georgia. A Northern Shrike perched on a tall snag, giving us great views. We spotted a Red-breasted Sapsucker perched at the top of a tall Conifer. A Bald Eagle was spotted flying high in the blue sky alongside a Red-tailed Hawk. Could they be from the nest in Victoria last summer ? 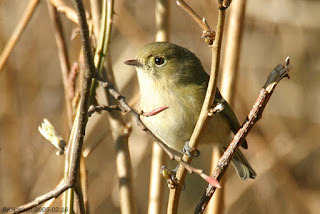 Twenty-one birders including visiting birders from Yellowknife, Jasper, Red Deer, Calgary and Seattle saw and heard the following fifty-one species. Check this site (www.thebirdstore.blogspot.com)early Tuesday and Sunday on stormy mornings to see if the walks have been cancelled! The Tuesday Bird Walk on February 27, 2018 will be going to the Qualicum River Estuary in Qualicum Beach. Meet at the Parksville Community Park (near the Lions Club playground parking lot) in Parksville at 9:00 am, or at the Brant viewing platform in north Qualicum Beach at about 9:20 am.